Live Colorado: With sunshine throughout the year, Colorado children have plenty of opportunities to get out and play. 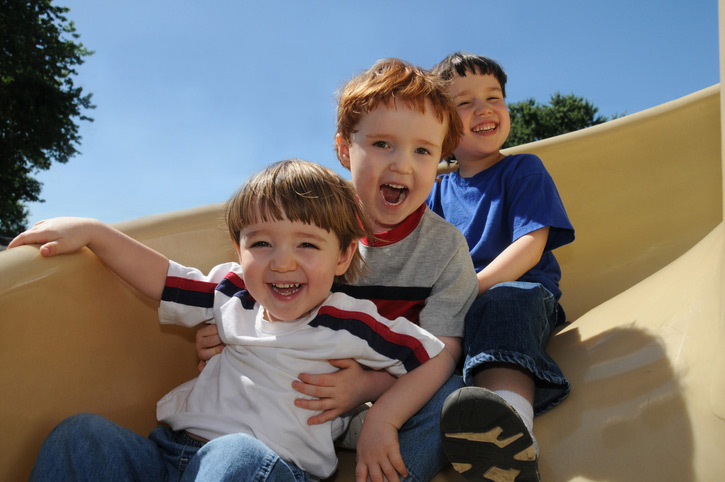 We share some of the state's top playgrounds. With more than 300 days of sunshine every year, Colorado children can get outside and play nearly every day of the year. And play they should, says Dr. Mihir Patel, a family medicine doctor at UCHealth Primary Care Clinic – Castle Rock. “Kids are naturally drawn to other kids. They want to run. They want to play. They want to jump,” said Patel. Yet, screens distract many children and keep them indoors far more than children of previous generations. So families have to make a concerted effort to escape electronics and get children moving. Patel and his colleagues recommend at least 60 minutes of physical activity a day for children and no more than 60 minutes of screen time. “Video games, iPads and computers all take up their time. It’s up to parents to limit screen time and get kids outside,” said Patel. He loves heading with his 5-year-old daughter to one of their favorite places, Bison Park in Castle Rock. Patel also enjoys mountain biking and playing basketball there with neighborhood buddies. Patel advises everyone to wear plenty of sunscreen, dress appropriately for the weather and bring water. Here’s a list of some of the top playgrounds in Colorado so you can find your favorites. Make it your family’s hobby to find new great parks and go play! 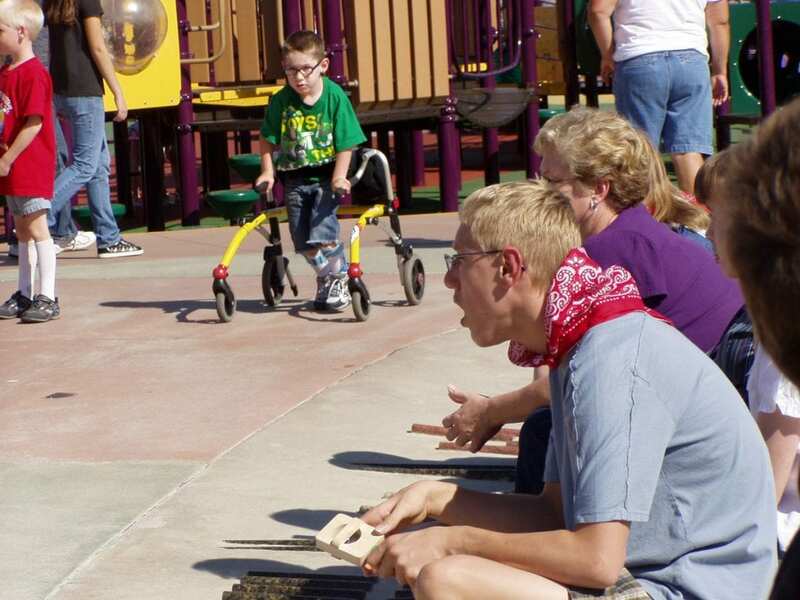 People of all abilities can play at Inspiration Playground in Fort Collins. Photo courtesy of the City of Fort Collins. This very special playground lets all children of all abilities explore, play and connect. Inspiration, which is located in Spring Canyon Community Park, 2626 W. Horsetooth Road, is what’s known as a “universally accessible” playground. It’s for all people of all ages. Inspiration Playground in Fort Collins is one of Colorado’s best playgrounds. Photo courtesy of the City of Fort Collins. The playground features smooth surfaces and wide ramps that are accessible for kids with wheelchairs, walkers and support braces. Signs are in Braille for children with vision impairment. During the summer months, the playground also has a popular water feature with a splash pad that sends water squirting into the air. “It’s very inclusive. 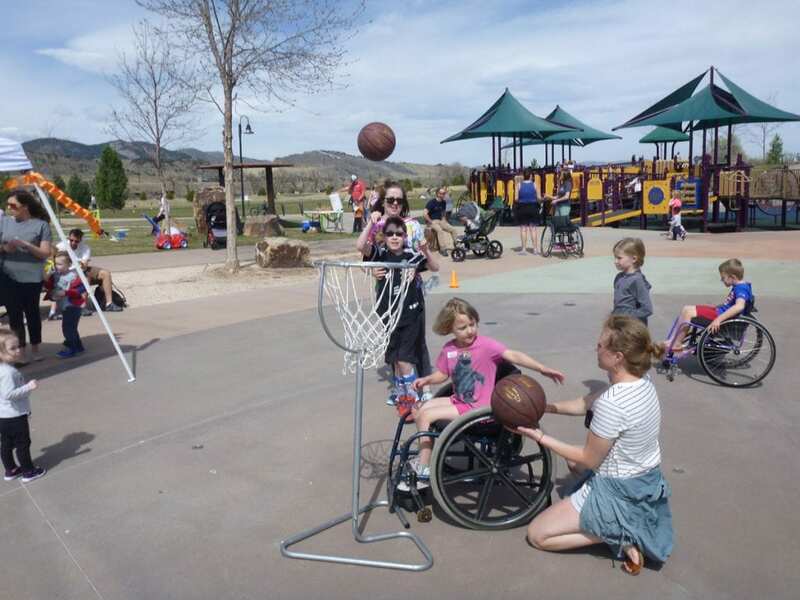 The playground allows everyone and anyone to do what kids are supposed to do: play together, connect, be outdoors and enjoy the space,” said Brenda McDowell, Adaptive Recreation Coordinator for the City of Fort Collins. Do you have a child who loves dinosaurs and other pre-historic creatures? Then you’ll want to check out this park at 5821 S. Lemay St. in Fort Collins. Children can climb up on a giant mammoth and swing from its tusks. They can sneak through the jaws of a shark and pretend to be archaeologists. The aptly named park ties in with Colorado’s rich geological history and also features a skate park and outdoor hockey courts for older children and teens. There are also great walking paths, tennis courts and a splash park in the summer. Great for all ages. Forget the plastic. Greeley designers sculpted this one-of-a-kind natural playground from good old-fashioned trees, rocks and dirt in the area. The new park just opened in August. Check it out at 2910 18th St. in Greeley. As the name implies, this playground is best for little ones. This park at 55 12th St. is close to the river and has shade for playing in the summer. The library is just over a bridge and there’s easy access to Steamboat’s popular Core Trail. This small gem is nice for little explorers. It features a unique natural, red-rock structure with caves and tunnels. It’s like a mini Flatirons for the young set. Nice for kids ages 2 to 5. Newly renovated with a bouncy play surface and fresh equipment. Adjacent to Eisenhower Elementary School, 1220 Eisenhower Drive. 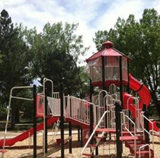 Arvada Volunteer Firefighters Park is a great spot for children who love firefighters. Photo courtesy of the City of Arvada. Does your child love donning firefighter duds, grabbing the hose and sliding down poles? Then this red playground is for you. Let your little ones climb around and pretend their responding to blazes. The park is located at 8351 Club Crest Drive and features a pavilion dedicated to the many volunteer fire fighters who protected Arvada for decades. Voted Summit County’s best park multiple times, Rainbow Park features a large playground plus a smaller one for kids under five with a castle theme. A popular walking path encircles the park, which has an array of other facilities including a skate park, and courts for sand volleyball, basketball and tennis. Find the park adjacent to the Silverthorne Recreation Center at 430 Rainbow Drive. 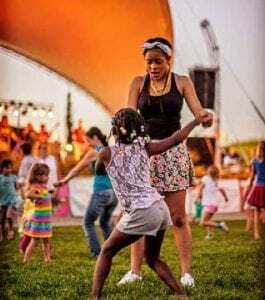 Dancing at Central Park in Denver’s Stapleton neighborhood. Photo courtey of Stapleton Denver. Denver’s third largest park features big fun on its playgrounds. There are play structures for kids of multiple ages arranged in circles along with fountains, a climbing wall and sledding for winter. Address: 8801 Martin Luther King Jr. Blvd. What’s not to love about a giant playground where you can make your entrance by sliding down a huge, curvy slide? Westlands has won oodles of awards as the best destination playground in the Denver area. And the kudos are well deserved. The playgrounds lie within a basin. There are structures for children (and teens) of all ages. Then, when kids tire of swinging and sliding, they can climb up fun structures or climbing walls and catch a view of the fields nearby. A picnic area is perfectly placed for both mountain views and supervision of the play areas below. You can find Westlands at 5701 S. Quebec St. This park is known for its fun ditch for wading along with a miniature train and a petting zoo. There are fees for the petting zoo and the train, but the playground and water play are free and plenty of fun. You can find Belleview Park at 5001 S. Inca Dr.
A large splash pad area provides cool water fun for hot summer days. Centennial Center Park features multiple large playgrounds and slides that accommodate lots of kids along with plenty of green space and an outdoor amphitheater. It’s a perfect park for picnics, birthday parties and listening to music during concerts. The park is located at 13050 E. Peakview Ave. This park sports another great splash pad along with newer play structures that are “universally accessible” for all children. The turf is soft and bouncy. There’s a great sand area for building castles and the playground features swings of all sorts. Find this park at 3555 Briargate Pkwy. This lovely little park is named for the first woman Parks director in Colorado Springs and has benefited from a recent re-do. The playground is accessible for children of all abilities and the park features a fun croquet area and putting green in addition to a pond with a waterfall and fountain. There’s also a meditation area where parents can breathe deeply for a moment or two while admiring the peaceful mountain views. Find Nancy Lewis Park at 2615 Logan Ave. This charming park features a nice playground and beautiful view of Pikes Peak. The nearby pavilion has a stone fireplace and is a great place for picnics. The park was recently renovated. There’s also a fishing pond and the stream that feeds into the pond is a great place for smaller children to get their feet wet. Memorial Park is at 117 Center Ave. Contributors included Kati Blocker, Erin Emery, Deb Idleman and Kim Vecchio.